The price has fallen to $789.99. 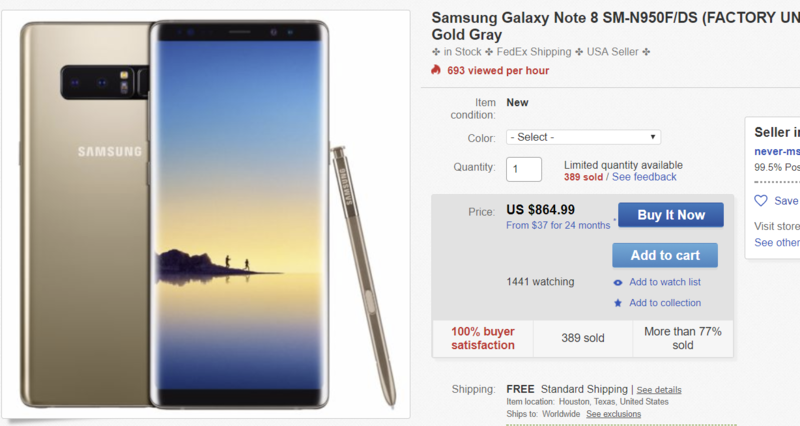 This isn't necessarily a Deal Alert, because there's not much of a discount here (the normal Note8 is around $999, depending on where you buy it from). But there is a small market out there for flagship phones with Dual-SIM support, and the Note8 is a pretty great device on its own. The model on sale has an Exynos 8895 CPU (not the Snapdragon found on US models), a 6.3" Super AMOLED display at 1440x2960, 6GB of RAM, 64GB of expandable storage, and Android 7.1.1. Even though this is the International model, it should still have most of the bands required to use LTE with US carriers. It even supports some obscure frequencies, like T-Mobile's Band 12. However, this will not work on CDMA carriers like Sprint and Verizon. You can buy it at the source link below.